In 1795, the Georgia legislature sold the state’s western lands (present-day Alabama and Mississippi) to four private land companies. A year later, amid revelations of bribery, a newly elected legislature revoked the sale. 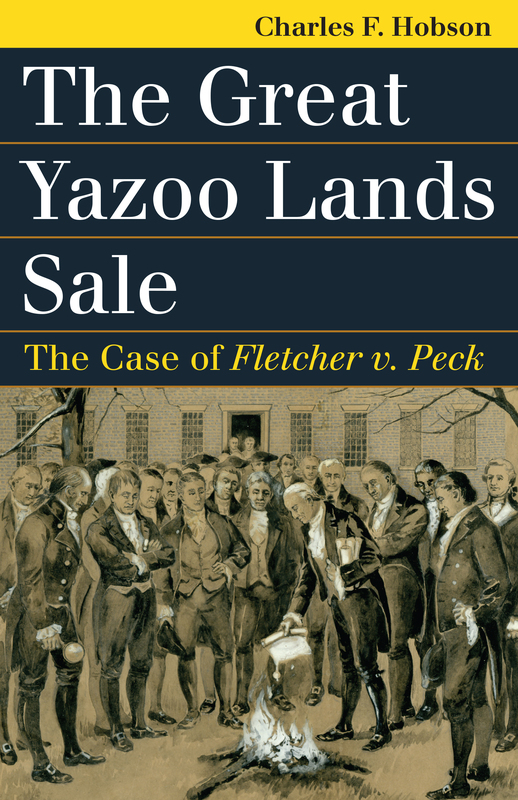 This book tells the story of how the great Yazoo lands sale gave rise to the 1810 case in which the Supreme Court, under Chief Justice John Marshall, for the first time ruled the action of a state to be in violation of the Constitution, specifically the contract clause. Truly a landmark case, Fletcher v. Peck established judicial review of state legislative proceedings, provided a gloss on the contract clause, and established the preeminent role of the Supreme Court in private law matters. Beneath the case’s dry legal proceedings lay a tangle of speculating mania, corruption, and political rivalry, which Charles Hobson unravels with narrative aplomb. As the scene shifts from the frontier to the courtroom, and from Georgia to New England, the cast of characters includes sharp dealers like Robert Morris, hot-headed politicians like James Jackson, and able counsel like John Quincy Adams, along with, of course, John Marshall himself. The improbably dramatic tale opens a window on land transactions, Indian relations, and the politics of the early nation, thereby revealing how the controversy over the Yazoo lands sale reflected a deeper crisis over the meaning of republicanism. Hobson, a leading scholar of the Marshall Court, lays out the details of the litigation with great clarity even as he presents a longer view of the implications and consequences of Fletcher v. Peck. Charles F. Hobson is the author of The Great Chief Justice: John Marshall and the Rule of Law, also from Kansas. For many years, he was on the staff of the Omohundro Institute of Early American History and Culture at the College of William and Mary, where he produced the scholarly editions of The Papers of John Marshall and St. George Tucker’s Law Reports. He was also resident scholar at the William and Mary School of Law.